The location of the composting facility is a very important factor in a successful compost operation. To minimize material handling, the composting facility should be located as close as possible to the source of organic waste. If land application is the preferred method of utilization, the facility should also be located with convenient access to the land application sites. Several other important considerations when locating a compost facility are discussed below. (i) Wind direction—Improperly managed compost facilities may generate offensive odors until corrective actions are taken. Wind direction and proximity to neighbors should be considered when locating a composting facility. (ii) Topography—Avoid locating composting facilities on steep slopes where runoff may be a problem and in areas where the composting facility will be subject to inundation. (iii) Ground water protection—The composting facility should be located downgradient and at a safe distance from any wellhead. A roofed compost facility, that is properly managed, should not generate leachate that could contaminate ground water. If a compost facility is not protected from the weather, it should be sited to minimize the risk to ground water. (iv) Area requirements—The area requirements for each composting method vary. The windrow method requires the most land area. The static pile method requires less land area than the windrow method, but more than the in-vessel method. The pile dimensions also affect the amount of land area necessary for composting. A large pile that has a low surface area to total volume ratio requires less composting area for a given volume of manure, but it is also harder to manage. The size and type equipment used to mix, load, and turn the compost should also be considered when sizing a compost area. Enough room must be provided in and around the composting facility to operate equipment. In addition, a buffer area around the compost site should be considered if a visual barrier is needed or desired. In general, given the pile dimensions, a compost bulk density of 35 to 45 pounds per cubit feet can be used to estimate the surface area necessary for stacking the initial compost mix. To this area, add the amount of area necessary for equipment operation, pile turning, and buffer. (v) Existing areas—To reduce the initial capital cost, existing roofed, concrete, paved, or gravel areas should be used if possible as a composting site. Finished compost is used in a variety of ways, but is primarily used as a fertilizer supplement and soil conditioner. Compost improves soil structure and soil fertility, but it generally contains too low a quantity of nitrogen to be considered the only source of crop nitrogen. Nutrients in finished compost will be slowly released over a period of years, thus minimizing the risk of nitrate leaching and high nutrient concentrations in surface runoff. For more information on land application of organic material, see chapter 11. A good quality compost can result in a product that can be marketed to home gardeners, landscapers, vegetable farmers, garden centers, nursery/greenhouses, turf growers, golf courses, and ornamental crop producers. Generally, the marketing of compost from agricultural operations has not provided enough income to completely cover the cost of composting. If agricultural operations do not have sufficient land to spread the waste, marketing may still be an attractive alternative compared to hauling the waste to another location for land spreading. Often, compost operators generate additional income by charging municipalities and other local governments for composting urban yard waste with the waste products of the agricultural operations. Finished compost has also been successfully used as a bedding material for livestock. Because composting generates high temperatures that dry out and sterilize the compost, the finished product is generally acceptable as a clean, dry, bedding material. Refeeding of the poultry compost as a food supplement is currently being tested and may prove to be an acceptable use of poultry compost. • A source of energy (carbon) and nutrients (primarily nitrogen). • Sufficient oxygen for an aerobic environment. The proper proportion of waste, amendments, and bulking agents is commonly called the "recipe." A composting amendment is any item added to the compost mixture that alters the moisture content, C:N ratio, or pH. Many materials are suitable for use as a composting amendment. Crop residue, leaves, grass, straw, hay, and peanut hulls are just some of the examples that may be available on the farm. Others, such as sawdust, wood chips, or shredded paper and cardboard, may be available inexpensively from outside sources. Table 10-6 shows typical C:N ratios of common composting amendments. The C:N ratio is highly variable, and local information or laboratory values should be used whenever possible. A bulking agent is used primarily to improve the ability of the compost to be self supporting (structure) and to increase porosity to allow internal air movement. Wood chips and shredded tires are examples of a bulking agent. Some bulking agents, such as large wood chips, may also alter the moisture content and C:N ratio, in which case they would be both a bulking agent and a compost amendment. (i) Compost design parameters—To determine the recipe, the characteristics of the waste and the amendments and bulking agents must be known. The characteristics that are the most important in determining the recipe are moisture content (wet basis), carbon content, nitrogen content, and the C:N ratio. If any two of the last three components are known, the remaining one can be calculated. * For further information on C:N ratios, see chapter 4 of this handbook. decomposition and volatilization of ammonia. If it is high, the composting time increases because the nitrogen becomes the limiting nutrient for growth. Moisture—Micro-organisms need moisture to convert the carbon source to energy. Bacteria generally can tolerate a moisture content as low as 12 to 15 percent; however, with less than 40 percent moisture, the rate of decomposition is slow. At greater than 60 percent moisture, the process turns from one that is aerobic to one that is anaerobic. Anaerobic composting is less desirable because it decomposes more slowly and produces putrid odors. The finished product should result in a material that has a low moisture content. pH—Generally, pH is self-regulating and is not a concern when composting agricultural waste. Bacterial growth generally occurs within the range of pH 6.0 to 7.5, and fungi growth usually occurs within the range of 5.5 to 8.5. The pH varies throughout the compost mixture and during the various phases of the composting process. The pH in the compost mixture is difficult to regulate once decomposition is started. Optimum pH control can be accomplished by adding alkaline or acidic materials to the initial mixture. (ii) Compost mix design process—The determination of the compost mix design (recipe) is normally an iterative process of adjusting the C:N ratio and moisture content by the addition of amendments. If the C:N ratio is out of the acceptable range, then amendments are added to adjust it. If this results in a high or low moisture content, amendments are added to adjust the moisture content. 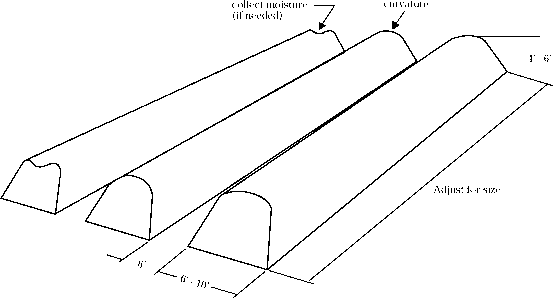 The C:N ratio is again checked, and the process may be repeated. After a couple of iterations, the mixture is normally acceptable. Figure 10-33 is a mixture design process flow chart that outlines the iterative procedure necessary in determining the compost recipe. compost mix design. 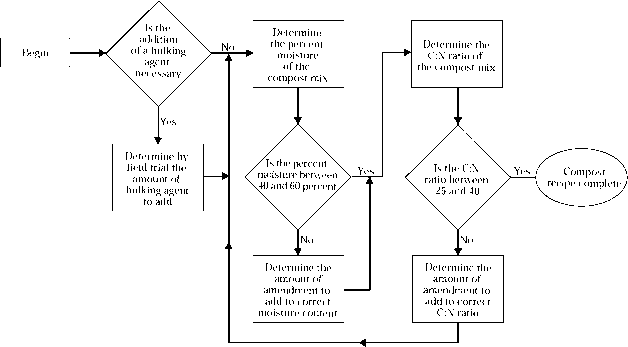 These steps follow the mixture design process flow chart shown in figure 10-33. Step 1: Determine the amount of bulking agent to add. The process normally begins with determining whether or not a bulking agent is needed. The addition of a bulking agent is necessary if the raw waste cannot support itself or if it does not have sufficient porosity to allow internal air movement. A small field trial is the best method to determine the amount of bulking agent required. To do this, a small amount of raw waste would be weighed and incremental quantities of bulking would be added and mixed until the mix has the structure and porosity desired. The wood chips, bark, and shredded tires are examples of bulking agents commonly used. Step 2: Calculate the moisture content of the compost mix. After the need for and quantity of bulking agent have been determined, the moisture content of the mixture or raw waste should be calculated. Chapter 4 of this handbook gives typical values for moisture content (wet basis) of excreted manure for various animals. Because water is often added as a result of spillage from waterers and in the cleaning processes, raw waste that is to be composted may have significantly higher moisture content than that of "as excreted" manure. If the amount of water added to the manure can be determined, the moisture content of the mix can be calculated using equation 10-11, ignoring the inappropriate terms. Note: To avoid confusion and repetition, the combination of "as excreted" manure, bedding, water, and bulking agent will be referred to as the "compost mix."